It has been a while since I posted! I can’t believe I have been such a slacker. To my followers, I apologize! Dieting does not make for fun cooking (at least not for me :() However, I have made some really delicious cupcakes that I wanted to share with you. I am sure that most of you know something about Pinterest. Well, I love that site! I think I may have mentioned this before, but I really do! And not just for food ideas either (although it is a foodies’ paradise!) There is all kinds of loveliness on there 🙂 There are so many things I want to do now; there just isn’t enough time in the day or money in the bank to do them 😦 Anyway, Pinterest is where I found the idea for these cupcakes, and while the original recipe didn’t work well for me at all, after a few tweaks to the ingredients, I had these adorable, delightful cupcakes. These cupcakes are sweet for sure, but the flavor profile is exquisite! Rich and decadent cupcake with a light, fluffy frosting and to top it off a fresh-baked itty bitty chocolate chip cookie 🙂 These were fun to make and even more fun to eat, lol. Well, after I said that, I had about 2 days to decide what I was going to make and in the mean time I had promised to make cookies for Goldilocks and the three Bears. 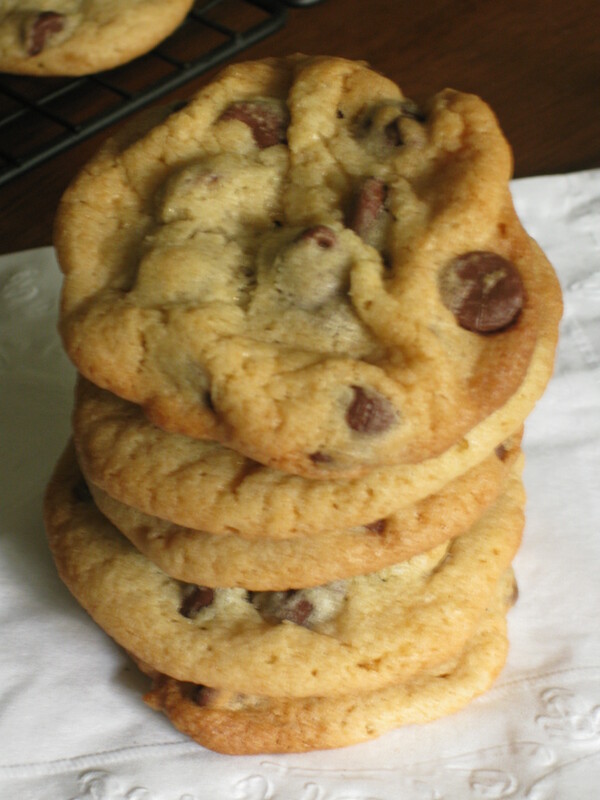 I knew I had everything to make chocolate chip cookies and I also knew that I wanted to experiment with this classic cookie recipe to get exactly the kind I like. Just FYI, I like them crispy on the outside, soft on the inside and perfectly full of flavor. These cookies, I am happy to say, fit the bill. I mean, they were just perfect! At least for me 🙂 Anyway, while I was making them I was still pondering what I was going to make for our playdate. It hit me that I had the above cupcake pinned on one of my Pinterest boards and I immediately knew that I was going to make that. Like with every recipe I try, I follow it to the letter. I had read through the comments and saw that there were several people who had issues with the cupcakes “falling”, “exploding” and just not coming out in general. Obviously there are people out there that don’t follow recipes well, or just don’t like to (my father is one of those). So I went ahead and attempted the recipe as written. I don’t know how to fix things unless I can see what is truly wrong. I mixed everything together, scooped it into some really cute cupcake wrappers and popped them in the oven. 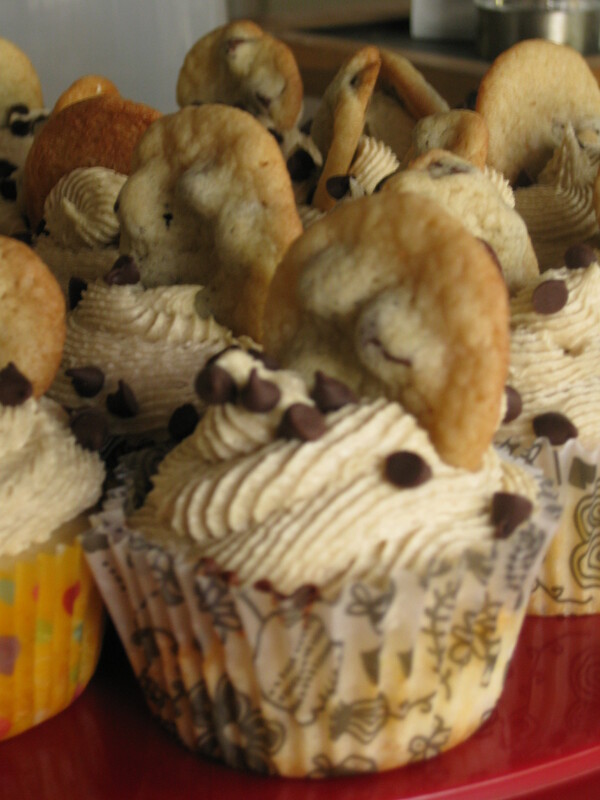 Everything was looking (and smelling) all right, except the cupcakes seemed to be a little flat on top. I thought, that’s ok, I can work with that, they are getting frosted after all. Well, they weren’t quite done when I checked them the first time, and when they were “done” they had sort of spread over the top of the cupcake pan, sort-of pancake style…not so pretty… but they hadn’t “fallen” in the middle like others had complained of. At least, they hadn’t YET. I left them to cool a few minutes before I dumped them out of the pan. When I came back into the kitchen, I no longer had cupcakes. I had these ugly, hard, bowl looking things that, get this, didn’t even taste very good! I was SOOOO disappointed! But, I also knew I could fix them. I knew I had just enough of everything I needed for one more try, besides, I had already made the frosting and the mini chocolate chip cookies…. So, I changed (and added) a few ingredients to fix the problems I had with the original recipe, scooped it into (more) cute wrappers, popped them into the oven, crossed my fingers and prayed! If these didn’t come out, I was going to have to come up with something else entirely and it was already 10pm. 18 minutes later, I had some beautifully rounded, delicious smelling white chocolate cupcakes. That DIDN’T fall. I was dancing around the house, I was so happy they came out…Silly, I know, but I think I was a little delirious. Once they cooled I frosted them, topped them with mini chocolate chips and mini cookies and Voila! Dessert made for a Queen 🙂 They were definetly a hit, My hubby scarfed down two of them and told me they were incredible. Before you think he was just saying it to please me, He is always honest and tells me if he doesn’t like something or if it isn’t good, or as good as it could be. He knows I want him to tell me so I can fix it; makes sense, right? Anyway, I posted a couple of recipes that I have mentioned in previous posts and there will be more over the next few weeks (as long as I don’t get completely distracted again, lol) So….Stay Tuned…..